This book was ground-breaking in its time. While hardly current, it nevertheless provides a thorough and often-entertaining history of the finest law enforcement agency in the world. I bought a copy when it first came out in the 1970s and I still pull it off the shelf and refer to it from time to time, since I now write about the FBI myself. It makes excellent reference material, but it is also very readable. It’s written in a journalistic style, which is unsurprising, since Ungar was a print journalist when he wrote this book. I recommend it. This entry was posted in Uncategorized on September 26, 2013 by Russ. I mentioned in an earlier post that I dislike what politics does to language. A good example is how we refer to minorities of all types now. The acceptable terms keep changing and if you use the term you grew up using that was considered the polite or correct term at the time, you suddenly are pegged as a racist, homophobe, or something equally deplorable. A good example is the word crippled. My grandmother, who didn’t have a mean bone in her body, often referred to children stricken with polio – a rather common phenomenon in her youth – as crippled. She didn’t mean it as a put-down. Kids in those days were crippled in every sense of the word. They were often encumbered by clunky wheelchairs or crutches and were unable to participate fully in athletics and most other mainstream activities. I used to attend a YMCA camp in the Santa Cruz Mountains every summer as a child. There was a camp right next to ours run by the Easter Seals organization and it was called the Crippled Children’s Camp. That was its official name. Fortunately, as time went by, afflicted individuals (see how cleverly I avoided using any of “those” words) became more fully integrated into society, and technology improved their ability to participate in a wider range of activities. Polio vaccines have also greatly reduced their numbers (except among the anti-science morons who find their children in iron lungs again these days, but natural selection will deal with them). Over time the word crippled became politically incorrect and was replaced by disabled, then by handicapped. Then even that became politically incorrect, at least to many, and it has been replaced by “handicapable” or “differently abled.” Give me a break. These concocted monstrosities are inconvenient mouthfuls that convey nothing other than the speaker’s conformity to the political agenda of that interest group. People who can’t walk are crippled. Handicapped, too. There are things they can’t do, jobs they don’t qualify for. That doesn’t mean we should treat them badly or exclude them from full participation in society. Quite the opposite. Let’s just not point an accusatory finger at those who use plain honest words. I could cite similar examples involving race, sexual orientation, etc., but someone would be bound to take offense. In fact, I have no doubt someone already has. Maybe I’m just a logophobe. This entry was posted in Uncategorized on September 20, 2013 by Russ. 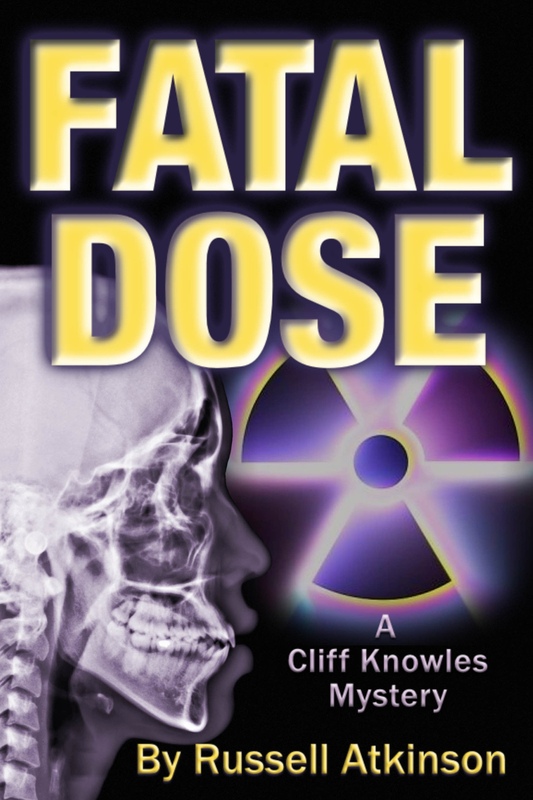 Fatal Dose follows geocaching FBI agent Cliff Knowles in the third riveting installment of the popular Cliff Knowles Mysteries series. This entry was posted in Uncategorized on September 14, 2013 by Russ. We'd have to cut out "leave it lay". Would go for "hello, dear, it's me." Would be allowed to use comprise. This entry was posted in Uncategorized on September 12, 2013 by Russ. This entry was posted in Uncategorized on September 9, 2013 by Russ. I just got back from the Saint George, Utah area where I attended the 2nd International EarthCache Event (2IEE). I arrived two days early in order to spend some quality time with an old FBI buddy who lives nearby. There are few things finer in life than riding a good trail horse through the Kolob Canyons area in perfect weather swapping stories of old times with a friend. I’d ridden Molly, a sweet, gentle mare, before, and she was as good to me as ever. The vistas, whether from atop Molly or sitting on Jim and Judy’s deck, beer in hand, at sunset are breathtaking. The area is just west of Zion National Park. Its interesting geology makes it an excellent choice for an EarthCache event. The event was sponsored by Geological Society of America (GSA) and blended geocaching with the study and appreciation of geology. The GeoAware team at GSA kindly gave me some space on the vendor table to sell copies of my book Cached Out. The geocachers in attendance were generous in their enthusiasm for the book. Thank you to all the purchasers, and I hope you enjoy it. This was the first time I’ve traveled to a distant location for a book signing event, but it was certainly worth it.